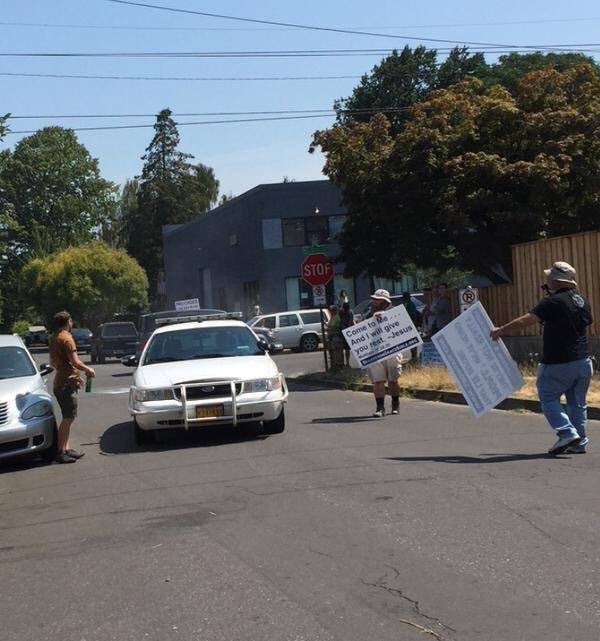 PORTLAND, Ore. — At least six Christians were attacked with a cleansing agent on Wednesday while preaching the gospel and standing for life outside of a Planned Parenthood facility in Portland, Oregon, but the man who committed with the act was not arrested and was let go without charges. The pro-life outreach was part of the Biblical Church Evangelism Conference hosted by Beaverton Grace Bible Church and organized by its pastor, Chuck O’Neal. As over 20 Christians stood on the public sidewalk to proclaim the word of God and the gospel of Jesus Christ through preaching and the holding of signs, a man who is believed to have brought a woman to the facility began yelling at the Christians and then blanketed half of dozen of them with scouring powder. O’Neal and Miano said that they don’t believe the man was taken to jail but rather escorted home. They called 911 to request that police return and take a criminal complaint. Some of those affected were interviewed and their testimonies presented to the district attorney’s office, but not all witnesses were questioned. Miano, who served in the police force for 20 years and is now an evangelist, said that he believes Gillock handled the situation improperly. The canister of Comet inside of the Portland police vehicle. “If he was thinking as a civil servant, if he was thinking as one who is charged with protecting life and property, he would have secured that suspect so that he couldn’t hurt anyone else, and then he would have checked on the condition of those who had been assaulted, and then he would have conducted a thorough investigation,” he explained. Miano further outlined that he believes that the outcome would have been much different had the perpetrator and victim roles been reversed. Christian News Network spoke with the Portland Police Department, but was informed that the man will not be prosecuted as the situation is being considered a private criminal complaint. The pastor responded by explaining that the Christians were rather present to love their neighbor. O’Neal and Miano state that the mishandling of the situation by police is an anomaly, as the Portland Police Department has been otherwise diligent about protecting the free speech rights of Christians.